Screenwriter: Armando Iannucci, David Schneider, Ian Martin & Peter Fellows, from the graphic novel La Mort de Stalin by Fabien Nury & Thierry Robin. Previewed at: The Reel Room, Sydney, on 12 March 2018. British satirist Armando Iannucci is better known for his television writing and directing of series like The Thick Of It and Veep than he is for cinema, but The Death Of Stalin is not his first foray into film; he previously co-wrote and directed the 2009 political spoof In The Loop, although admittedly it was a spin-off from The Thick Of It. In his new film he makes fun of one of the grimmest of times in Soviet Russia, the last days of Joseph Stalin’s ‘dictatorship of the proletariat’ and, in particular, the events that took place immediately after the murderous leader’s death in March 1953. And what extraordinary events they were. The all-star cast speak their roles in their own voices, replicating in a way the diverse accents that would have surrounded Stalin. For one thing, Stalin himself was Georgian (as was Beria) so he would’ve had a very different inflection than most Muscovites; others in his circle came from diverse parts of the Soviet territories. It’s a device that works and you soon don’t notice the different modes of speech. What you do notice is the ‘every man for himself’ attitude that drives these characters. The story the screenplay follows is reasonably close to the truth, hard as that may be to believe; in fact, in some parts the reality is so outlandish that the writers had to tone them down, lest they weren’t believed. 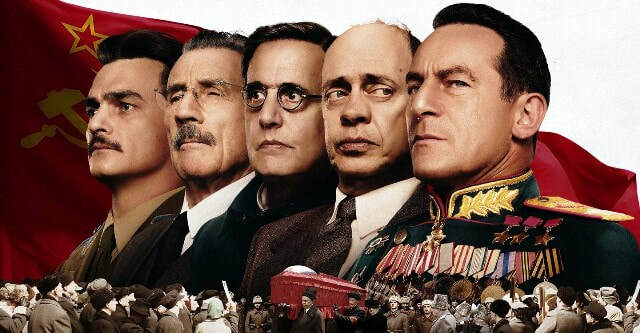 The Death Of Stalin gets darker and darker as it progresses and, indeed, it gets harder and harder to laugh as events come to a head. There are good reasons for the MA15+ classification! These are “dirty deeds, done dirt cheap” but they’re very costly for the losers.